Fairy bluebirds and leafbirds range in length from about 6 to 11 inches (13 to 30 centimeters), and weigh, on average, about 0.5 to 2.8 ounces (13 to 80 grams). Their toes are relatively small for their size, and their ankle bones are short and thick. The birds' bills are fairly heavy. The fairy bluebird adult males are the color of an ultramarine to a turquoise, or cobalt blue, with the color going down over the lower tail. The rest of the bird is the color of black velvet or deep blue. Females are duller in color than the males, as are the juvenile birds. However, the juveniles differ from the females due to their lack of a bright red iris. In leafbirds, both male and female have very bright green plumage, feathers. Fairy bluebirds and leafbirds are similar to bulbuls in that many of their feathers are shed when they are handled. The four iora species have patterns with various shades of yellow and dull green, and black in some males. All but the great iora have dark wings contrasted with white bars in both males and females. The eyes are pale gray. Their beaks are black, thin, and not curved. 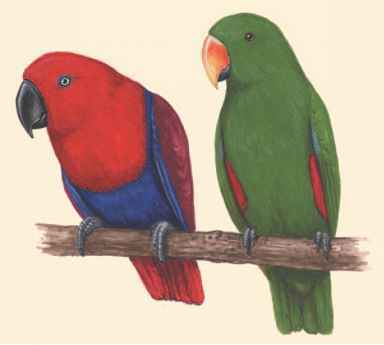 Nonbreeding male ioras have dull plumage. Fairy bluebirds and leafbirds share two characteristics with bulbuls. Those similarities are that the upper tail coverts, feathers at the base of the tail, are long and fluffy, and the patch of hair-like feathers that have no veins on the nape of the neck. They also share the vocal ability that most bulbuls have.